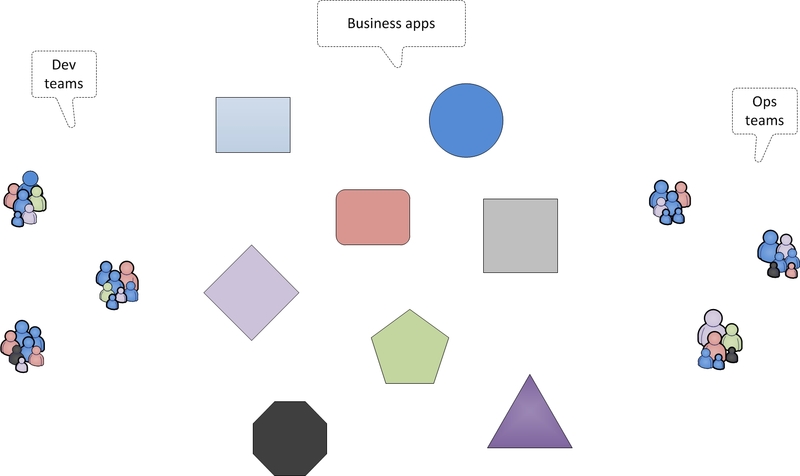 This entry was posted in devops by Niek Bartholomeus. Bookmark the permalink. 1. 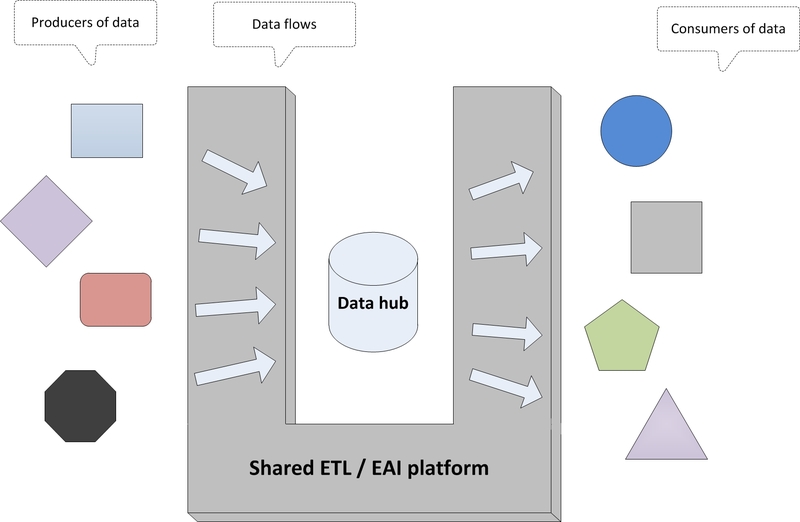 Centralised data repository: a local optimisation that highlights the dangers of shared dependencies – they inflate batch sizes and increase the risk of release failure. It sounds as though the architecture team have different incentives to the business and/or release management team. A more holistic approach is to design for rapid release and prohibit shared dependencies – Sam Newman has done a great talk on this (http://skillsmatter.com/podcast/agile-testing/designing-for-rapid-release). 2. Mutualised infrastructure: a short-term decision that substantially increases both the cost and probability of server failure. I’m guessing that like so many other organisations your Snowflake Servers (http://martinfowler.com/bliki/SnowflakeServer.html) are deemed to have large upfront setup costs, but Immutable Servers (http://martinfowler.com/bliki/ImmutableServer.html) are deemed more costly! In my experience this smells of an organisation that values efficiency over optimisation, and understands cost reduction better than increasing value. 3. Development teams distanced from recruitment: this is a massive problem in many organisations. If I am the interviewer and not a team member, I have authority for hiring a candidate but with no responsibility for a candidate being suitable for the team I have no incentive to make a good decision. It’s really important development teams are empowered to make their own recruitment decisions. 4. Code reviews: no reviewing of code is clearly bad, but I believe standalone code reviews are akin to Release Testing – a futile attempt to inspect quality into a product (http://blog.deming.org/2012/11/inspection-is-too-late-the-quality-good-or-bad-is-already-in-the-product/). A far better approach is pair programming, where code reviews happen 100% of the time and the feedback loop is minimal. 5. Change management: the need for a change manager implies large batch sizes, long lead times, and trying to control change to control risk – but all this does is increase batch sizes, holding costs, and transaction costs. In my experience overcoming this issue is dependent upon personal relationships. 6. Deployment requests: many organisations use email to drive their release process as it provides a cheap communication protocol and a cheap audit trail, but copy/paste errors can easily creep in and the asynchronicity of email means wait times can easily be introduced. 7. CAB meetings: this seems to be another effort to control risk, but the lack of business involvement means that a cost/benefit analysis is impossible – the cost of releasing (transaction cost) can be debated, but the cost of *not* releasing (holding cost) cannot be debated. 9. Deployment templates: given that everyone probably hated filling out such documents, a quick win to get people on board with Continuous Delivery might be to automate such documents. Not the largest accessible constraint by any means, but one that would endenger good will amongst stakeholders. 10. Config management: config management can be very hard to solve! It’s taken me a while to process all of this, but it’s great stuff! Indeed, the central data repository solved one problem but created another, one that was not so much in the spotlight at that time and that was probably not sufficiently taken into account in hindsight. I agree that a good architecture (like a good configuration management) can avoid a lot unnecessary dependencies, but that doesn’t take away that there will always remain the “fundamental” dependencies that the software delivery process will have to deal with. Exactly: cost reduction of existing value over optimizing for adding new value. I don’t necessarily see this as a problem though. I guess it depends on what business you’re in. In a mature market there is probably less incentive to optimize for fast delivery and in that case mutualization may be a successful strategy. See also my response to your second comment on utility vs strategy. Sorry, I meant that the dev *tools* team had no say in the hiring process of developers. The problem here was that sometimes the dev team had no incentive to hire a good (as opposed to a cheap) candidate which eventually increased our workload in terms of the support, troubleshooting etc we had to give. For me it all comes down to assuring quality from the earliest point possible. Pair programming is good, but hiring a candidate with the right experience and mindset is even more powerful in my opinion. Again, cost reduction over adding value. But even if IT is considered a utility, software is so complex that the overhead created by having a dev team or a support team that is far away (physically as well as mentally) from the rest of the IT department may actually cost more than the gain of outsourcing/off-shoring the teams in the first place. Agree, see also my follow-up posts on configuration and release management. At a higher level, I think a much more damaging issue is the organisation-wide strategy that “information technology is not the core business” despite “15 development teams, each one covering the IT needs for one business domain”. That is an awful lot of software being built by an awful lot of software developers, by a company that explicitly favours buy over build! I agree with Martin Fowler’s Utility vs. Strategic Dichotomy (http://martinfowler.com/bliki/UtilityVsStrategicDichotomy.html) – it’s perfectly acceptable to buy commercial software packages provided that a) the domain is not a strategic differentiator and b) business processes change to match the utility software, not the utility changing to match the business processes. It seems as though your organisation chose the latter option and fell into the Package Customisation antipattern (http://martinfowler.com/bliki/PackageCustomization.html) – by building so many integrations on top of third party software, risk and quality concerns can only increase and you end up being trapped between unmalleable business process and unmalleable software. I think traditional enterprises have a lot of what Martin Fowler calls utility projects. He mentions a range between 80 and 95% and for these companies it’s probably closer to 95%. So in that sense he seems to agree that the way to go here is to buy the software instead of building it. A bit further in the article he mentions that instead of customizing these packages with the specific needs of the company, instead custom applications should be developed and integrated with the packages. And that’s exactly what the majority of these 15 development teams do: they integrate packages and custom developed applications with one another. 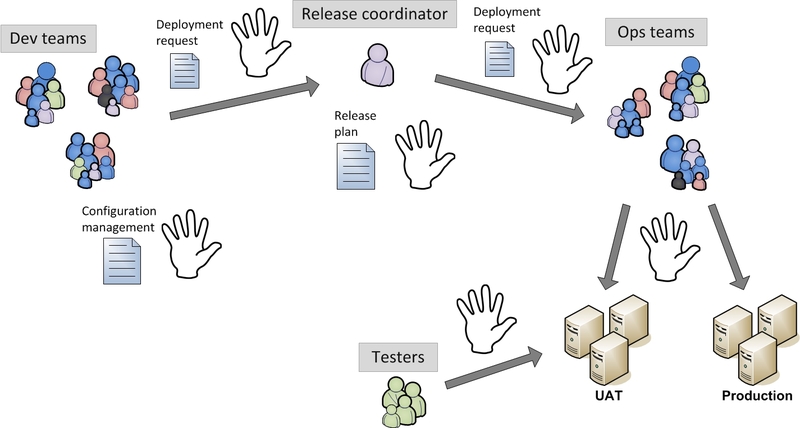 This situation generates indeed a huge QA and deployment challenge, something that should be addressed in some way or another if we want a “fast and reliable” software delivery experience but rather than rewriting all packages in-house an easier solution might be to put pressure on the vendors to add support for automated testing and deployment in their packages. Check out Sam Newman’s talk on Designing for Rapid Release (http://skillsmatter.com/podcast/agile-testing/designing-for-rapid-release), around 30 mins in he talks about the Spider antipattern – that’s your central data repository.